The Blog Formerly Known As The Blue Cottage: Papa! 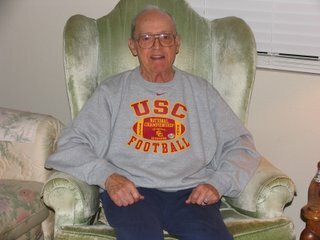 90 years young...and a USC fan since 1939. Pop is the coolest 90 year old in the west! He still wears jeans and sneakers, I love this guy! USC should make him there Grand Puba of football. He looks great in his sweatshirt and I'm so glad I found him something he enjoy wearing. So Pop wanna go dancing? (that's an inside joke between me and Pop) Great photo Joey! can you please show me how to use my camera so I can grow up (only slightly) and take cool pic's just like you??? Please, please, please! Okay maybe I'm a ways off from the growing up part!